Time is money. How much is 30 minutes a day worth to you? e! Flo solves the problem of “which chat to use” because it works with all your emails, from anyone. 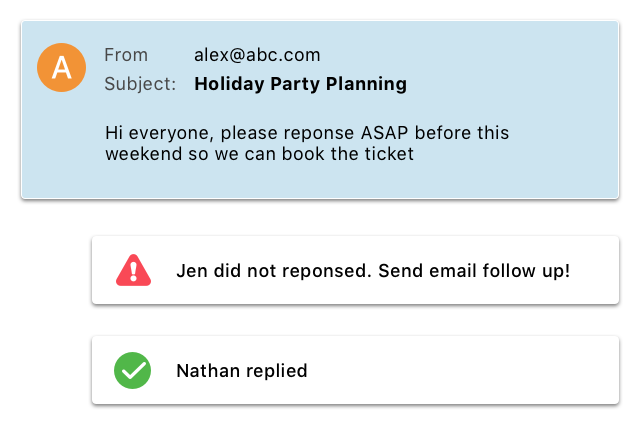 Turn any incoming email into a simple chat conversation. Respond directly to specific messages within a chat, no need to scroll to the bottom. Looks like Flo just trumped Chat. Flo can open your apps and docs for you, keeping everything neat and tidy. Flo keeps tabs of what you’re working on, by creating tabs for each document. No more scrounging around your messy desktop to find stuff. Now you don’t have to remember that George should respond to your email, because Flo is tracking it for you. Flo will remind you if George does not respond within your determined time-frame. Gone golfing! Drag a task into Flo’s ‘everything' calendar to schedule it. Or let Flo do the work: select one or more tasks from your list, choose “auto schedule”, and Flo drops them right into the free time in your Calendar. Now you'll only need to look in one place to find out what you have to do, and who you have to meet, today or all week long. View Flo Full Screen, or in Normal mode you can scrunch it to one small side of your screen so there’s room for all your other stuff. And all of your Emails, Agendas, ToDo’s, Note and Contacts are still available from the handy Organizer. Go ahead, spread out. You can link anything to anything. Open a Meeting invite, start taking notes, generate a few ToDo’s, set another meeting, and add people. They’ll all be linked. Click to jump. Who needs that big magnifying glass? Your free Flo account includes a built-in organizer module with industry-standard Email, Calendars, ToDo’s, Notes and Contacts that can be shared with other applications (but you probably won’t need to!) You can also easily add industry-standard accounts from the ‘other guys’ including Google, iCloud, Yahoo, and Outlook IMAP. Flo for Mac connects to Flo on your iPhone, Watch, iPad, and even your web browser. Everything syncs seamlessly, just as you would expect. Never worry about where our information is.